Ready for a fun-filled day with your tiny ones? 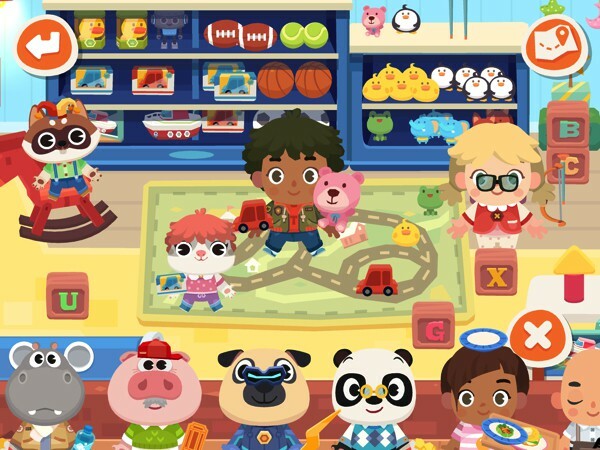 Dr. Panda Town: Mall is open for business and it's the perfect app for kids who love to role-play and explore. With so many things to do and discover, they are bound to enjoy this newest virtual playset from Dr. Panda. Dr. Panda Town: Mall is an open-ended experience where kids explore a virtual three-story mall that features six unique stores. The app has up to 16 characters that vary in age, skin tone, and even species. Additionally, there are lots of fun surprises to discover, such as costumes, items, and hidden gift packages. There is no right or wrong way to play, and kids can make up their own stories about the places and characters. It's also worth a mention that Dr. Panda Town: Mall supports a shared map: if you already have Dr. Panda Town installed on your device, you can bring characters and objects between the two apps. This allows kids to create interesting scenarios and greatly increases the play experience. In Dr. Panda Town: Mall, the floors are connected by an escalator at the far-left end of the screen. To move between floors, kids must first place a character on the elevator. They then choose whether to go up or down. When kids begin the app, they will start on the first floor. Here, they can find a clothing store, a toy store, and a gift-wrapping corner. There is also an ATM and a water fountain near the mall's entrance. The clothing store houses many outfits and accessories, such as hats and glasses. The toy store has a model town with a fire-breathing dinosaur, a train kit, a toy rocket, lots of stuffed toys and even musical instruments. There is also a stage where kids can host all kinds of performances. The second floor is where kids will find a public toilet, ATM, salon, pet store, and photo corner. At the salon, they can give their characters new hairstyles and hair colors. At the pet store, they can play with different animals and role-play as a vet. The third floor houses a juice bar, cake shop, movie theater, and food court. At the movie theater, kids can drop by at the snack bar for drinks and popcorn, or try out the superhero costumes on the display. They can also put on 3D glasses and make themselves comfortable before the movie starts. Dr. Panda Town: Mall is free to download, but to fully enjoy the app you will need to unlock the shops via in-app purchases (IAPs). These purchases are one time only, which means once bought it will permanently unlock the content for your account. The IAPs are secured by a parental gate to prevent kids from making unwanted purchases. There are no third-party ads in Dr. Panda Town: Mall. Once all the shops have been unlocked, there really are so many things to see and play with in this virtual shopping mall. Each floor is packed with delightful details. Kids can try to replicate their recent visit to the mall, or just go wild with their imagination. It's also fun to just poke and prod things to see what they do. Kids can, for example, splash around at the dancing fountain or try their luck at the crane machine. They can also come up with new drinks at the juice bar or make cotton candy at the movie theater's snack bar. One things that I found a little funny is that the characters are facing the wrong way in the movie theater (they are looking at the projector and not the actual movie). I suppose it's a design limitation, but it does make for a silly scene. That said, this app is fantastic and bound to be a hit with young kids and Dr. Panda fans in general. Dr. Panda Town: Mall is a terrific urban-themed playset for kids who love to role-play and tell stories. This virtual shopping mall is overloaded with details that kids may need to spend a few hours just to discover all the hidden surprises. Great for ages three and up. Dr. Panda Town is a must-have for kids who love storytelling and any Dr. Panda fan. It offers an expansive, colorful world where they can let their imagination run loose with their favorite Dr. Panda characters. Because there are so many secrets to uncover, they can spend hours and hours just having fun.